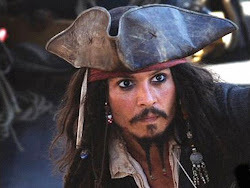 Snippets of Jack: "What the Black Pearl is, is Freedom"
"Wherever we want to go, we go. That's what a ship is, you know. It's not just a keel and a hull and sails; that's what a ship needs. Not what a ship is. What the Black Pearl really is, is freedom." -Jack Sparrow in The Pirates of the Caribben: Curse of the Black Pearl. You almost can't tell that Jack is drunk when he says this. In this sceen, Jack and Elizabeth are stranded on an island. 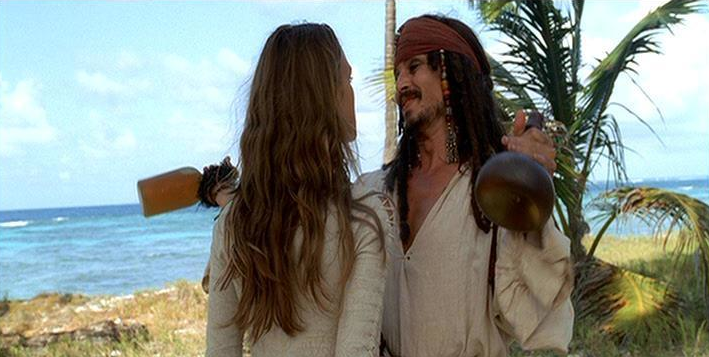 Of course, its not that bad for Jack since he has his best friend with him, RUM! So as they sit in the sand talking about their feelings, Jack vents about how much he loved being captain of the Black Pearl. Although he continued to bear the name "Captain Jack Sparrow", his crew lead by Barbossa abandons him on an island to die. The very same island that Jack sits upon with Elixabeth. He tells the story to everyone of how he got off the island by tying some turtles together with his back hair to make a boat. That's not what really happened. Instead, he found the island was a place where a beer company kept their rum. So he hung out on the beach drinking until one of the trade ships came to pick up the rum and also took him. Once off that island, he sets out to get his boat back. Then of course, he just makes a full ciricle and finds himself trapped on the island again. That means absolutely no freedom. The ship means everything to Jack. All his life he has sailed around the great blue. Having that ship was all he really wanted. He even agreed to give his soul to Davy Jones for it. Jack and the Black Pearl are like two peas in a pod!